Despite recent glitches with NASA's Phoenix Mars Lander onthe arctic plains of the red planet, the mission became a resounding successwhen it found signs of water ice on Thursday. Four days ago Phoenix photographed dice-sized crumbs ofbright material in a trench informally called "Dodo-Goldilocks." Whenthe probe recently went back to look at the trench, they had vanished. Thedisappearing act convinced scientists the material was frozen water thatvaporized after digging exposed it. "It must be ice," said Phoenix principal investigatorPeter Smith of the University of Arizona, Tucson. "These little clumpscompletely disappearing over the course of a few days, that is perfect evidencethat it's ice. There had been some question whether the bright material wassalt. Salt can't do that." Themission was designed to investigate whether the arctic plains environment couldhave been habitable to microscopic life. Water is an essential ingredient forlife. Researchers knew there was abundant water ice at the polar caps, andthere is strong evidence for water ice below the surface away from the poles,based on satellite observations. The Phoenix finding stands to be the firstsolid, photographic evidence for this subsurface ice away from the polar caps. On Thursday the probe made another potentially excitingdiscovery: While digging in a different trench, called "Snow White2," Phoenix's Robotic Arm connected with a hard surface that also may turnout to be an icy layer. "We have dug a trench and uncovered a hard layer at thesame depth as the ice layer in our other trench," said Ray Arvidson ofWashington University in St. Louis, a co-investigator for the robotic arm. The Phoenix science team spent Thursday analyzing the newimages and data successfully returned from the lander earlier in the day. Prior to the discovery, Phoenix had suffered a few glitches,including recent memory loss and a clogged oven. While these issues may givethe mission the appearance of a rocky start, they are par for the course,mission managers said. In fact, Phoenix has already been successful enough to merita one-month extension to its planned 90-day mission. Barry Goldstein, Phoenix project manager at NASA's JetPropulsion Laboratory, said the spacecraft's troubles were the type of issuesthat could be expected for the complex $420million dollar mission. "We knew it was going to be difficult to operate on thesurface of Mars, so we designed the mission such that we could guarantee thatwe'd meet our full mission success even if we lost one out of every three dayson the surface," Goldstein told SPACE.com. "We're now on sol [Martianday] 24 and we've lost one. So by that metric we're way ahead ofschedule." 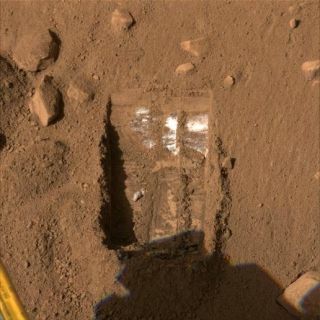 Phoenix successfully landed in the flat Vastitas Borealisregion of the Martian arctic on May 25 and subsequently deployed its roboticarm to begin scratching for frozen water ice beneath the dirt-covered surface. But the probe lost some science data this week when itsmemory got clogged with housekeeping information regarding its computer functions.Engineers traced the problem to a pair of software bugs that caused the spacecraft'sfile-saving algorithm to run on an endless loop of robotic navel-gazing that createdheaps of data ? about 45,000 data packets when they normally expect only a few. The glitch caused Phoenix to overwrite some scienceobservations it had gathered the day before, though all this data was lowpriority and can be collected again. The issue also prevented mission managersfrom uploading Phoenix's science commands on Wednesday, the 23rd sol of themission. "The worst damage we had in all of this is we lost asol on the surface ? it?s the first sol that we lost," Goldstein said. "We feel we have taken all the necessary steps to mitigate the problem. Wewon't have any overwritten science data anymore based on the corrective actionwe've taken." Earlier in the mission, Phoenix encountereddifficulty when trying to pour a sample of dirt into one of itsinstruments, the Thermal and Evolved-Gas Analyzer (TEGA) oven, which is designedto bake Martian dirt and analyze the vapors it emits to detectits composition. When Phoenix's robotic arm first scooped dirt onto the oven'sfilter that sifts out coarse grains from fine, not enough of the stuff actualmade it through into the instrument. But mission engineers fixed the problem byordering Phoenix repeatedly use a vibration tool to shake the oven screen,jostling enough of a sample through the filter. "The transfer into the TEGA was growing pains, in myopinion, in trying to learn how to get a sample into the oven. I expected we'dbe struggling in learning how to get the samples delivered. Frankly, weresolved that very rapidly in my opinion and I'm very pleased," Goldsteinsaid. "I was more concerned at the beginning when we had the problem withthe short in the TEGA." That first problem occurred justfive days after thelander touched down on Mars. When Phoenix tried to start up the TEGA oven,one of the instrument's heating filaments shortcircuited. Luckily, the oven was able to function using a backup filament. Overall, Goldstein said, the issues Phoenix has encounteredhave been the type of minor, but inevitable, setbacks one would expect with acomplicated planetary mission. "We're approximately one third into the mission and Ibelieve it's going better than I'd expected," he said. "Not only am Ipleased in the lack of quantity of glitches we've had, I'm also very pleasedthat the glitches we have had have really been very minor and we've been ableto deal with them very quickly. It?s a lot better than I expected and a lot betterthan we had planned for."